But a few updates: My fabulous blogiversary painting give away is taking a minute. I've now emailed another subcriber (because the first never responded.) If I don't hear from them, another will be selected Monday morning. That means if you're reading this from your email box, you could still win! In other news, "Gadjo" a painting of Jala Pfaff's lovely Siamese cat has been accepted into the 12th Annual VMRC Art Exhibition at the Park Gables Gallery in Harrisonburg, VA. This year they had 462 entries and accepted 99. It's a very well run show and I'm pleased to be included! Congrats and I love the lighting on this one, but the expression! oops! ... I meant " PLUS the expression!! " 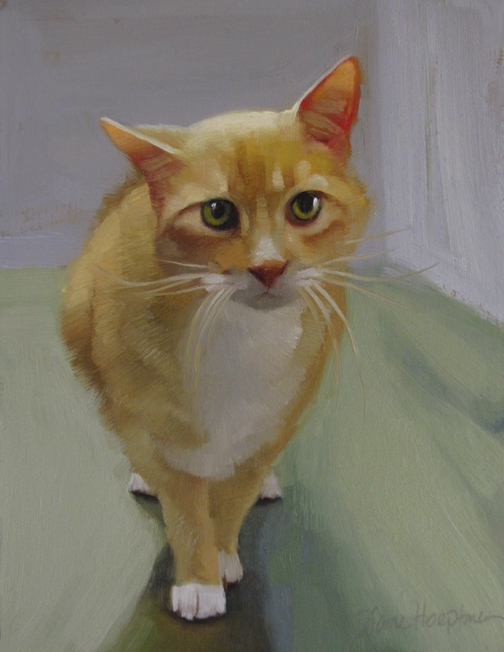 gorgeous painting !...and keeping my fingers crossed for the competition ..
Beautiful portrait of this cat, Diane!